Ponteland Online News: Lugano Invitation to an Exhibition of Initial Birney Hill Proposals 27th October. Lugano Invitation to an Exhibition of Initial Birney Hill Proposals 27th October. 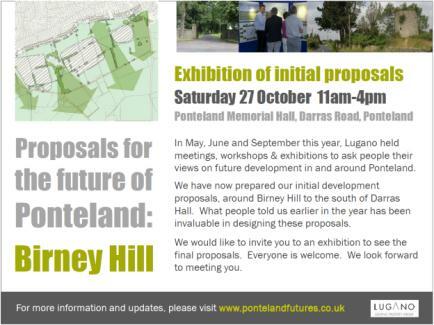 Everyone is welcome to come and view the proposals at a staffed exhibition on Saturday 27 October between 11am and 4pm in the Lounge at Ponteland Memorial Hall, Darras Road, Ponteland. Experts from the Lugano team will be on hand to explain the proposals. The proposals at the exhibition will show in more detail the generous amount of green space around and through the proposed housing. If planning permission is granted, around 280 properties would be built over the next few years in a phased development. As well as high quality low-density large houses, there would be sixty affordable houses with no hidden service charges. The affordable houses would cost around £110,000-120,000 for a two bedroomed house and £130,000-140,000 for three bedrooms on generous plots. The Birney Hill proposals also offer 30 to 50 self-build plots at £150,000 to £200,000 to allow larger houses with landscaped gardens to be constructed. Innovative building techniques integral to the development will address local flooding concerns, with sustainable drainage systems (SuDS) managing the risk of surface water flooding, improving water quality and helping biodiversity. New cycle ways, bus links and pedestrian walkways would be created to minimise traffic generation and pressure on existing roads in Darras Hall. The new vehicle and bus links would enable easy access around the development and to schools, shops and facilities in Ponteland. Other elements of the proposals include the establishment of a Community Trust to give local people control over investment in infrastructure and community benefits, as well as managing allocation of the low cost housing. The scheme also includes will include a ‘hub’ at the existing Birney Hill farm steading in which a farm shop, cafe and play area will form part of the attractive scheme, sitting alongside carefully preserved buildings. Care has been taken to protect and enhance local views, and to create a smart, green garden village design for Birney Hill. The houses would be built to the highest level of sustainable design, including cutting-edge technologies to minimise the costs of future heating, electricity and water consumption. Everyone is welcome to come along to the exhibition in the Memorial Hall, Darras Road, Ponteland on Saturday 27 October from 11.00am to 4.00pm.